Government of Sri Lanka has accorded high importance to the development of infrastructure including expressway network with inter-connectivity as it will directly contribute to the economic growth and will have indirect effects in raising the productivity and efficiency in different economic sectors. To complement the existing expressway network, Central Expressway Project (CEP) has been initiated with a purpose of linking Colombo with Kandy and Kurunagala. Section 1 of the CEP will start from Kadawatha where four expressways, namely Outer Circular Highway (OCH) II, OCH III and Colombo-Katunayaka Expressway and the Central Expressway link through the Kadawatha interchange. This will create an uninterrupted connectivity from Hambanthota to Katunayaka or Hambanthota to Kandy linking several provinces and economically important ports, airports and commercial cities. This proposed highway will improve the inter regional connectivity and efficiency of the entire expressway network. Accordingly, strengthening the financial cooperation between the Government of Sri Lanka and the People’s Republic of China in the field of the infrastructure development of Sri Lanka, the Export- Import Bank of China (EXIM Bank) has agreed to provide a concessional loan amounting to US$ 989 million covering 85% of the contract price, for the Central Expressway Project - Section 1 from Kadawatha to Meerigama. The total estimated cost of the project is US$ 1,164 million. Furthermore, this loan is the single largest loan approved by the EXIM Bank for Sri Lanka. 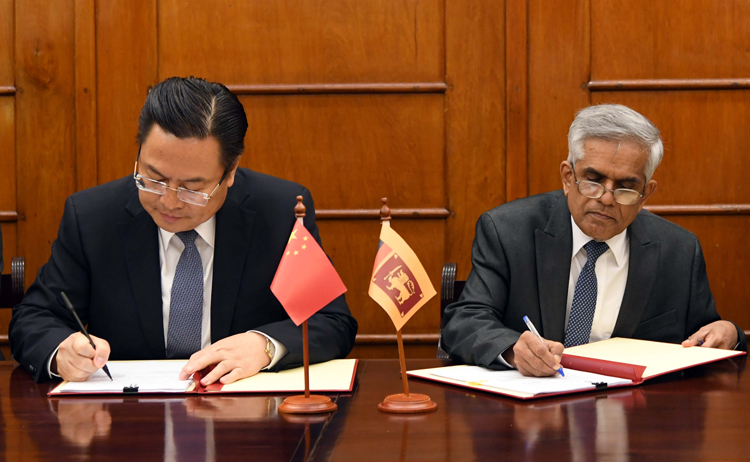 Accordingly, the loan agreement was signed on 22nd March 2019 by Dr. R H S Samarathunga, Secretary, Ministry of Finance on behalf of the Government of Sri Lanka and H E Cheng Xueyuan, Ambassador of the People’s Republic of China, Embassy of China in Sri Lanka on behalf of the Export – Import (EXIM) Bank of China at the Ministry of Finance, Colombo 01.